Log in to your OpenCart admin. Select Extensions > Payments > Amazon Pay and Login with Amazon. Set Payment Mode to Payment. Select an order from your orders list. Select the Payment Details tab. 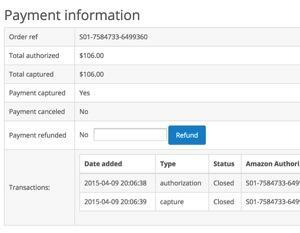 Scroll down to the Payment refunded section. Enter the amount to refund, and click the Refund button. To view your account balance, sign in to your Seller Central account.